The other day I took my three year old to the Insectarium, there were parts of it she loved and parts of it she was scared to death of. Out of everything she was in love with the lady bugs so I wanted to make her a special treat to remind her of the fun she had. This sweet treat is made out of fruit with a little chocolate and sprinkles. I was able to find the heart shaped sprinkles in Target’s dollar section. 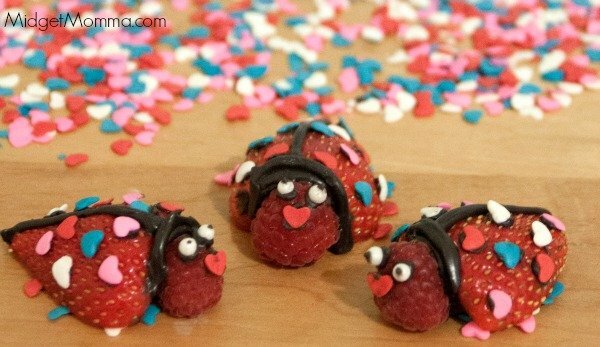 You want to make sure your strawberries are very dry or the chocolate will not stick to them. 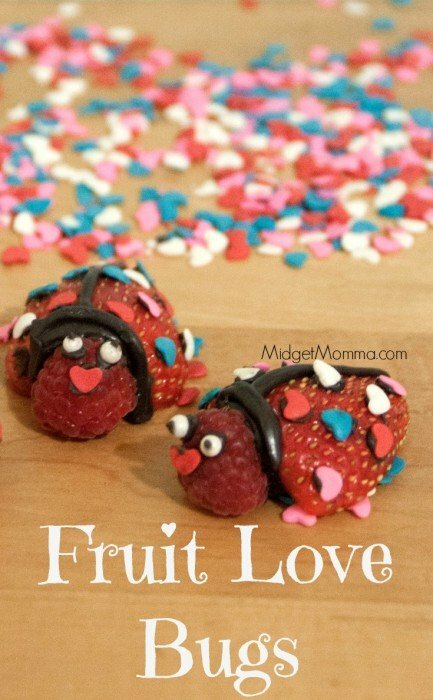 The kids will love these Fruit Love Bugs that are a combination of Strawberries, raspberries and chocolate with some sprinkles too! Clean and dry your fruit very well. Slice your strawberry in half and remove the stem. Place them cut side down on a sheet pan. Melt your chocolate and shortening 30 seconds at a time in the microwave, making sure your stir in-between. Pour chocolate into a small freezer ziptop bag and seal it. Cut a very small piece of one of the corners of the bag to make your pastry bag. Add a small amount of chocolate to the stem end of the strawberry than add a raspberry to it. Pipe a thin line down the top of the strawberry. Dot very small dots of chocolate to the top of the strawberries. While the chocolate is wet top each dot with the heart sprinkles. Add two dots of chocolate to the top of the raspberry than add the pearl sprinkles to it. Add a dot of chocolate to the top of each sprinkle for the eye balls. Add one dot of chocolate under the eyes and add a heart sprinkle for its mouth.